Local artists Kyle Simmers and Ryan Danny Owen will be selling a limited-edition risograph print of the book ahead of a wider release in November. 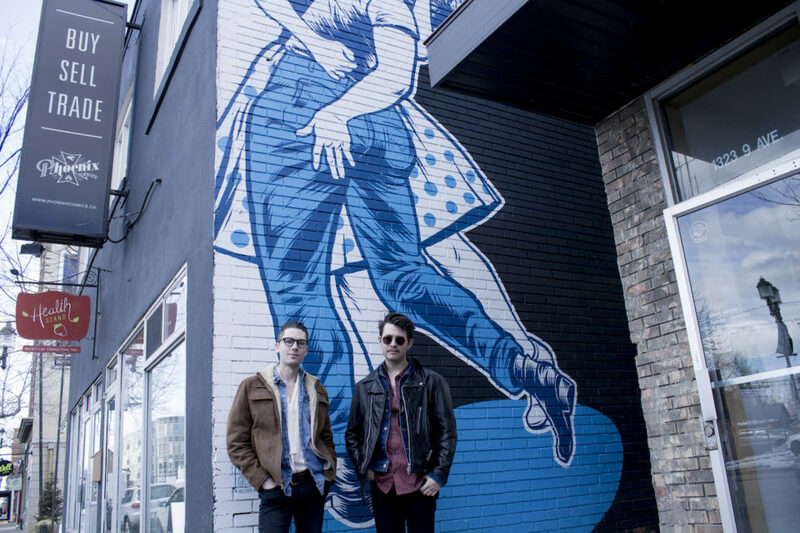 Pass Me By creators Kyle Simmers (L) and Ryan Danny Owen (R) are pictured in front of a mural by Kyle and Derek Simmers in Inglewood. Photograph by Colin Gallant. The first in the five-part graphic novel series, Pass Me By, will celebrate its limited-edition release on Wednesday, April 3 at Shelf Life Books. Entitled Gone Fishin’, this first chapter acquaints the reader with protagonist Ed as he grapples with a recent dementia diagnosis in small-town Alberta. Ed is a elderly man who is estranged from his family, living out the mostly quiet Autumn days of his life in sharp contrast to a stint in his youth spent touring with the fictional glam rock band Electric Vice. Pass Me By is described as a “queer rural Canadian tragedy” and is the brainchild of Kyle Simmers, an illustrator, muralist and multi-disciplinary artist who grew up in Bashaw, Alta. Simmers (who uses they and them pronouns) met collaborator Ryan Danny Owen while the two were students at the Alberta College of Art + Design (now Alberta University of the Arts). Owen had occupied an unused space on campus to run a guerilla-style gallery around the time that he and Simmers became friends. Simmers wanted to create a graphic novel inspired by their experience growing up in small-town Alberta that could help them process the hardship of their grandmother’s recent dementia diagnosis. Simmers knew they needed help when it came to dialogue and tasked Owen (who Simmers describes as a “huge film nerd”) to come aboard to bring the story to life. The pair began working on film-style scripts to plan out the narrative and visuals, crafting scenes and dialogue before Simmers would draw the soft-hued blue-and-pink pages for the story to live out on. This double page from Gone Fishin’ exemplifies its use of colour as a metaphor for memory. Copyright Kyle Simmers and Ryan Danny Owen. The pair knew they had a lot more than a book on their hands — the decision to create a five-volume series was decided after much deliberation, including Owen consulting a palm reader about the matter. Realizing the scope of the work they set out for themselves, the two launched a Kickstarter campaign to help fund their vision. The campaign reaped $9,131 from 72 backers, nearly double the duo’s $5,000 goal. This made for fantastic encouragement for the pair, but a pretty severe setback would come when Simmers fell from a ladder and severely broke their right arm on a sidewalk in Inglewood. Simmers was painting a mural (pictured in lead image) at 3 a.m. and had been pushing themselves too hard past the brink of exhaustion. The injury set back the timeline for Pass Me By and Simmers took it as a wake up call to slow down and not to forget self-care. You might say that Simmers had been experiencing a stubbornness not entirely dissimilar to Pass Me By‘s protagonist. Ed knows his mind is succumbing to dementia, but understandably doesn’t want to give up the independence of driving. This refusal to cede autonomy leads to a key conflict in Gone Fishin’ that precedes its denouement and segue for volume two in the series. After all, like many living with dementia, Ed still has partial lucidity. 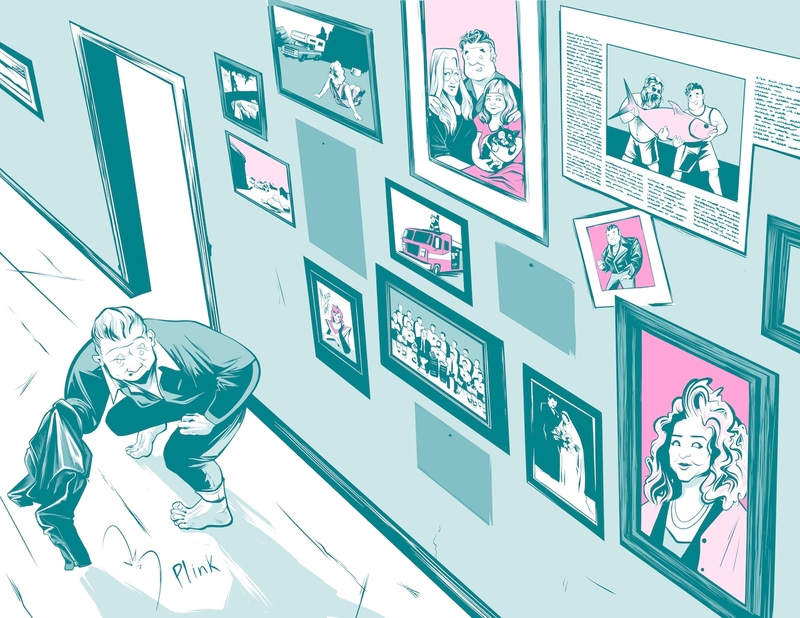 This is where the format of a graphic novel is best put to use, with pink hues being emphasized for the things Ed remembers best, and blue indicating mental fog. You can see it for yourself at Shelf Life Books this coming Wednesday, April 3 from 7 p.m. to 9 p.m. Simmers and Owen will be on hand to deliver an artist talk at 8 p.m. (moderated by event producer Sam Brown), and will be selling limited-edition copies printed by risograph as well as mugs, posters and enamel pins. 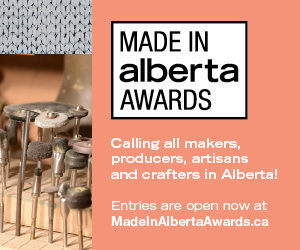 The book will cost $30 and is expected to sell out at the event — a standard edition will be released by Canmore-based indie publisher Renegade Arts Entertainment this coming November 6, 2019. Correction: In a previous version of this story, the mural in the lead photo was credited to solely Kyle Simmers. In fact, it was a collaboration between Kyle and their brother Derek Simmers.